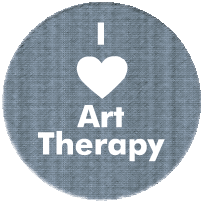 If you love art therapy too and want a badge like this one, or one of the many other patterns on offer for free, you can visit http://www.arttherapyblog.com. Or just click on the badge below. Link | This entry was posted in Senses, Treasure Chest and tagged Art, journaling, therapy. Bookmark the permalink. What’s Happening i’m new to this, I stumbled upon this I’ve discovered It absolutely helpful and it has aided me out loads.